PSNews – The Lam Dong Provincial Police’s Traffic Police Division will further cooperation with relevant units in checking vehicle drivers and strictly handling cases of drunk driving. Lam Dong Police launch campaign to combat drunk driving. The Lam Dong Provincial Police’s Traffic Police Division will further cooperation with relevant units in checking vehicle drivers and strictly handling cases of drunk driving. Within the framework of the campaign, the Traffic Police Division of the Lam Dong Provincial Police coordinated with relevant units to use world standard’s breath alcohol concentration calculators to check drivers and punish those whose alcohol levels exceed the limit in Da Lat city’s roads. 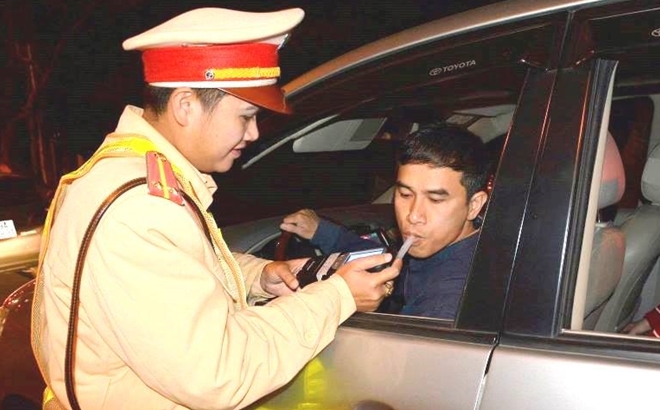 According to Lieutenant Colonel Do Quoc Hung, head of the patrol team of the Traffic Police Division of the Lam Dong Provincial Police, during November 2’s night, the team stopped more than 60 cars to check and handled 9 drivers with their alcohol levels exceeding the limit. Lieutenant Colonel Do Quoc Hung said the campaign will run until the end of the year.